I haven’t joined in with the Creative Space posts popular among many blogs that I read. But it seems like fun, and since I managed to find my camera (hiding in the depths of my handbag), I thought that I might play along today. So, what is happening in my creative space today? Some new stitch markers made some some beads that were threatening to become stash. I intercepted them just as they were trying to disappear to the bottom of a pile in my sewing room. 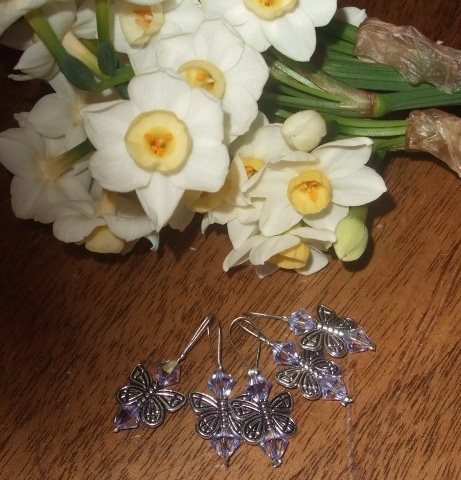 Lovely Swarkovski crystals and delightful butterflies which I am sure my girls will try to steal. They so love my stitch markers! And speaking of the girls, they picked me a bunch of flowers from the garden this afternoon – lucky me! Moving on, and trying not to keep using exclamation marks, this is my easy project for when the girls are around. It is yet another Olearia, this one is for Miss 2, she is super jealous of Miss 3’s new shrug with special buttons, and her own one is progressing nicely. I will make a cardigan for her though, as I have another 100g hank of this yarn too which will be plenty. 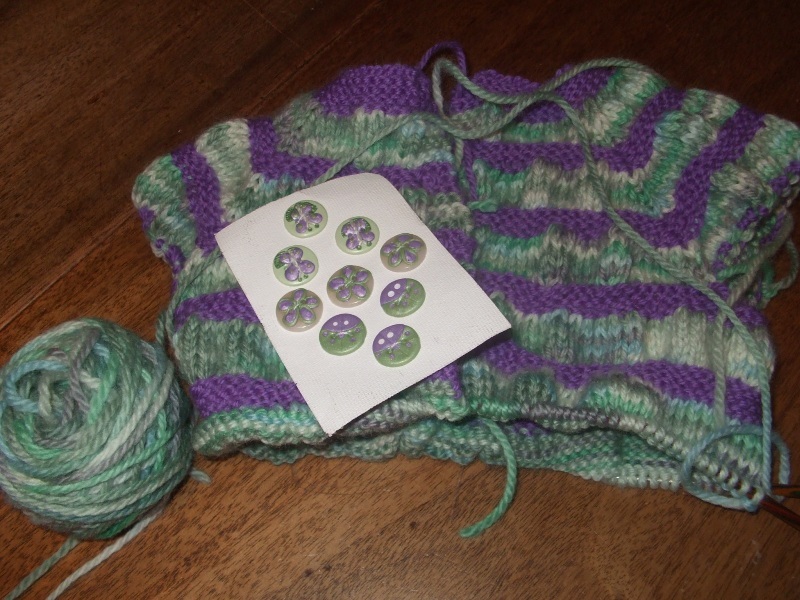 I’m using some Woolly Wumpkins Aran weight organic merino – scrumptious, teamed with some bright purple Colour 4 Me to tie in with the buttons. 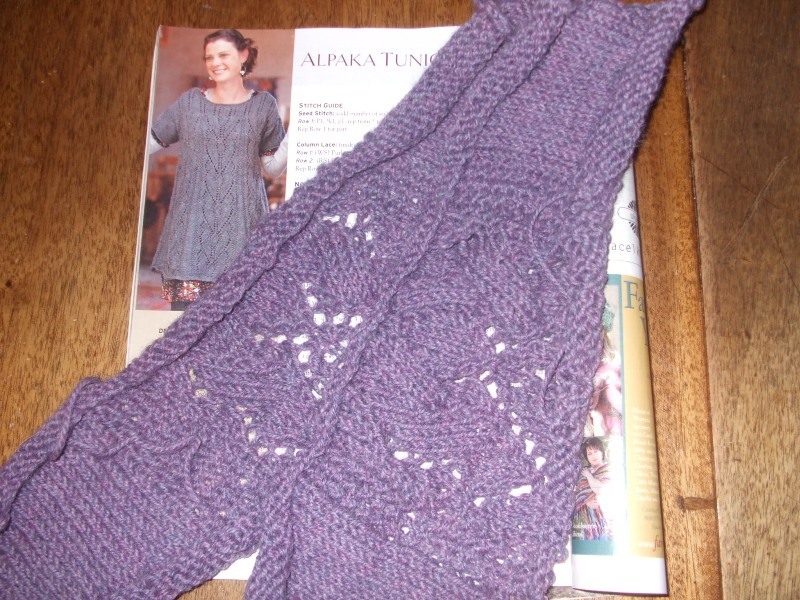 And on the selfish knitting side, I have cast on for the Alpaka Tunic which I fell in love with from last year’s Interweave Knits Fall issue. I used the sleeves as gauge swatch, and now both are done. I have even cast on all 264 stitches and joined them in the round to knit the body of the tunic, which I am adapting to knit in the round instead of in pieces. Waaay less purling, and no seaming. The perfect adaptation. I’m using Berocco Ultra Alpaca , and it is working up nicely. And on 5.5mm needles, it should hopefully knit up fast too. And that’s my creative space today. To check out more creative spaces, head over to Kootoyoo. butterfly sparklies.. yeah they’re doomed to be coveted by little girls!! cute!